I look forward to the upcoming update Things are close as we all know. We are just getting anxious. Adam as said from the beginning that certain things need to happen before actual RV happens. We all know this. Keep up the positive thoughts and excellent correspondence, especially in the Crypto Currencies forum. It is great that there is not cursing, F-bombs, etc.... going on at Dinar Vets. That is what makes it a great place to share and learn information. Joe B. The email snip was the response back from Mr. Issa. Agree, that you still can't go wrong with Mr. Issa, but he was the one that forwarded my email to the one listed above and they sent reply back to me with PW reset. Fireplug, What did you use for web address? Please post. I am late to this post, but still getting the error everyone has posted. Russian Ruble - time to buy in? Safe Dinar has circulated Ruble available. With the Russian Ruble currently getting weaker due to sanctions.....Is anybody buying low and holding waiting for the rebound? 1 - USD = 66.4244 RUB I'm thinking the Putin will have to give in sooner or later and the Ruble will bounce back. I am not an expert in currencies, but would like to hear some opinions. Cool. (was on the left side of screen, picture of a mouse on a desk with Online Banking as the header.) I saw the old login screen, but I get this error "PASSWORD HAS EXPIRED, PLEASE CONTACT YOUR SYSTEM ADMINISTRATOR!!!" Anyone know how to get a hold of the Sys Admin? I sent an e-mail from the Internet Banking link stating my issue, but I'm not sure if that is the correct person. Anybody else have to reset their password? Hit "Bank Profile" tab to login to your account. It wasn't obvious like other bank website in the US. EDIT I'm not able to login using my existing login. Anybody else having trouble? LINK = CIA Building Base C.I.A. Building Base for Strikes in YemenBy MARK MAZZETTI Published: June 14, 2011 WASHINGTON — The Central Intelligence Agency is building a secret air base in the Middle East to serve as a launching pad for strikes in Yemen using armed drones, an American official said Tuesday. Related Yemen’s Opposition Meets With Government Officials (June 14, 2011) Times Topic: Yemen — Protests (2011)The construction of the base is a sign that the Obama administration is planning an extended war in Yemen against an affiliate of Al Qaeda that has repeatedly tried to carry out terrorist plots against the United States. The clandestine American operations in Yemen are currently being run by the military’s Joint Special Operations Command, with the C.I.A.’s assistance and with the approval of Yemen’s fragile authoritarian government. But with Yemen’s embattled government on the brink of collapse, Obama administration officials are concerned that a future government might not support American operations. By putting the operations under C.I.A. control, they could be carried out as a “covert action,” which can be undertaken without the support of the host government. The construction of the base, first reported by The Associated Press, is further evidence that the administration sees armed drones as the weapon of choice to hunt and kill militants in countries where a large American military presence is untenable. Since he took office, President Obama has drastically escalated the C.I.A.’s bombing campaign in Pakistan using armed drones, and the spy agency has carried out more than 25 strikes there this year. The American official would not disclose the country where the C.I.A. base was being built, but the official said that it would most likely be completed by the end of the year. Discussions about the C.I.A.’s taking over operations in Yemen began last year, the official said, before the political uprising and violence that broke out in the country in recent months. Last month, the military renewed its campaign of airstrikes in Yemen, using drone aircraft and fighter jets to attack Qaeda militants. One of the attacks was aimed at Anwar al-Awlaki, the radical American-born cleric who is one of the most prominent members of the Qaeda affiliate group, which is called Al Qaeda in the Arabian Peninsula. The range of a Reaper is about 1100 miles, so the base probably already exists and word just got out to the main media. More then likely an upgrade to the air field. If not in Saudi or Oman. Djibouti, Africa would be logical. Less than 50 miles to cross the Gulf of Aden. Agree with Justin. I've done a couple of West-PACs, been to both Guam and Phillipines. Phillipines may not have the big bases anymore, but the US military is still there. Small units, but still there, just not in the mainstream and public eye. have active Smart cards for the public is a very important step. Whenever that RV happens the poor will instantly become wealthier without having to rush to the bank to pull money out. CITI BANK operations in Iraq !! weed out all the fluff, bottom line is Citi is preparing for big time operations. I agree with the consensus, Citi would not bother investing in Iraq if there is not "Big Time" profit involved. 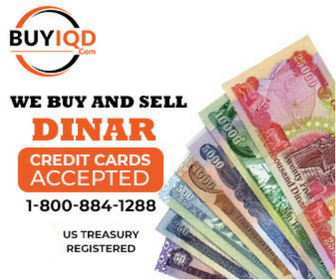 With the current status of the Dinar low, Citi Bank hired the right folks and is setting up to reap massive profits when RV happens. GO RV!!! Hopefully in June!!! Iranian influence sneaking in the room Hopefully someone calls him out on it.